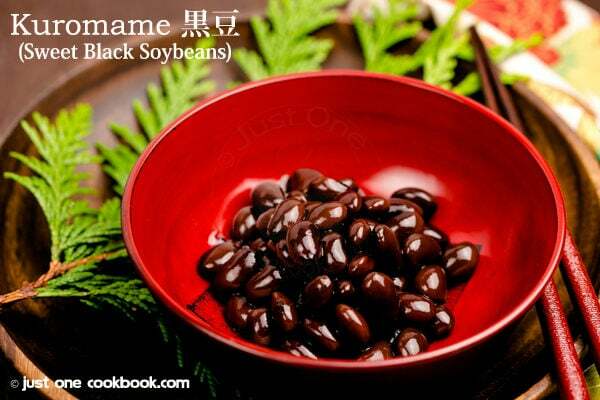 Kuromame (Sweet Black Soybeans) literally means “black bean (黒豆)” in Japanese, and it is often served on New Years Day as a part of Osechi Ryori (traditional New Years Meal). The shinny black beans are beautiful contrasting with red lacquer “jubako” (お重箱) container, which holds all different kinds of colorful traditional meals. 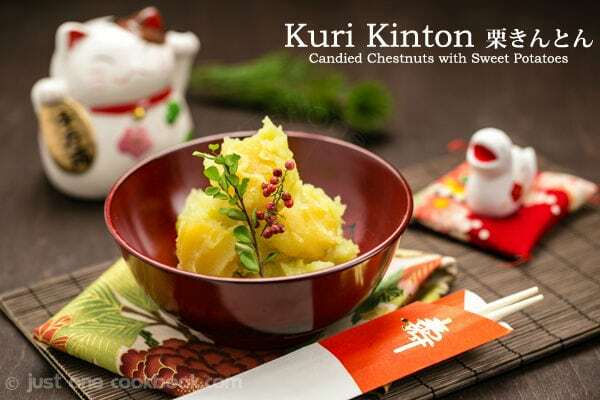 Eating kuromame is considered good for your health for the new year. My parents encouraged me to eat some kuromame on New Year’s Day but this is actually one of my favorite item among all the New Years dishes. 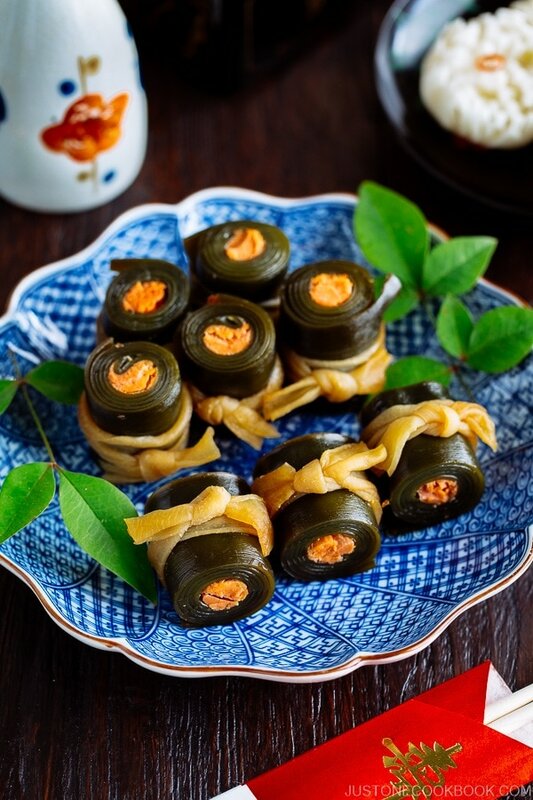 Kuromame’s sweet and slightly savory flavor can be quite addicting. 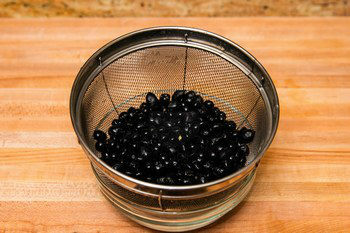 By the way, if you use “black bean” for cooking, please note kuromame is black soybeans. 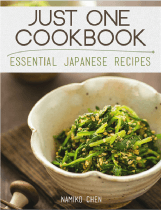 Kuromame recipe is pretty simple but the soybeans has to be simmered on very low heat for a long time. 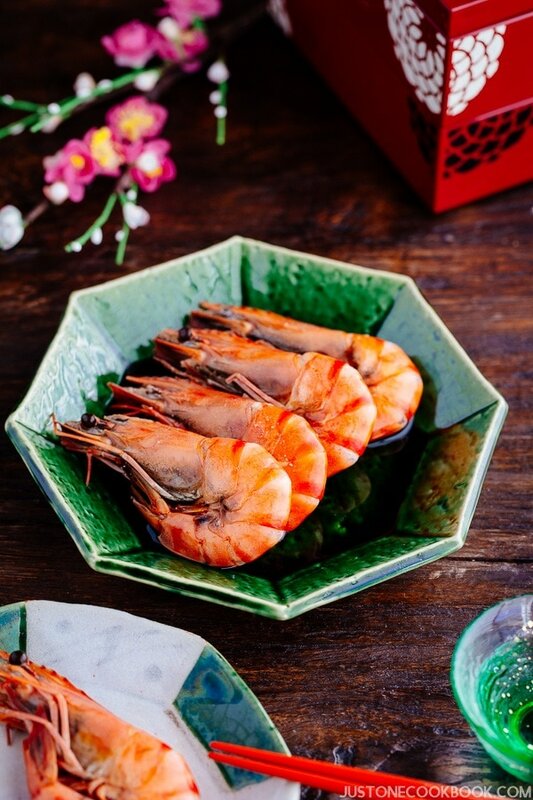 When it comes to traditional food and recipes, each family has a slightly different method to make them which passes down to generations. For kuromame, I’ve seen recipes which requires 8 hours but others are shorter. Most of traditional kuromame recipes require 2-3 “rusty” iron nails but for today’s recipe I made without them as an experiment. 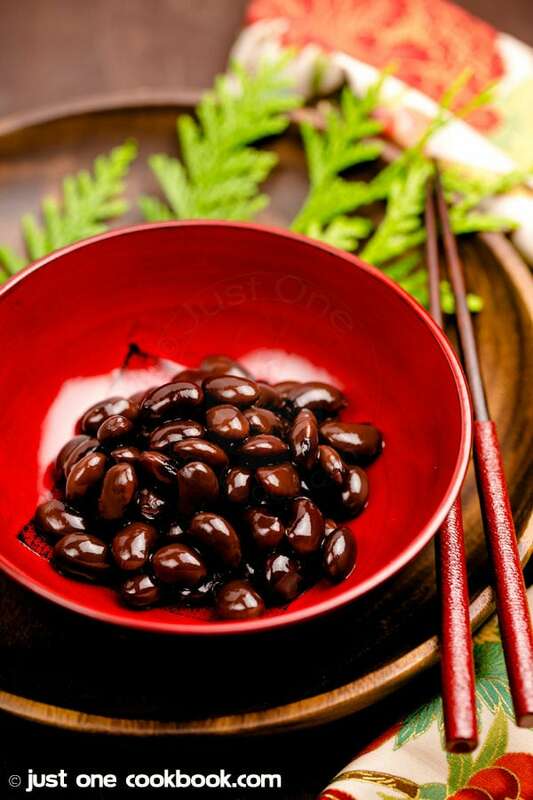 The reason why the Japanese put nails to cook kuromame is that rust (iron oxide) from nails has chemical reaction with tannin in the beans, which help the beans turn dark to a rich black color. How was the result? 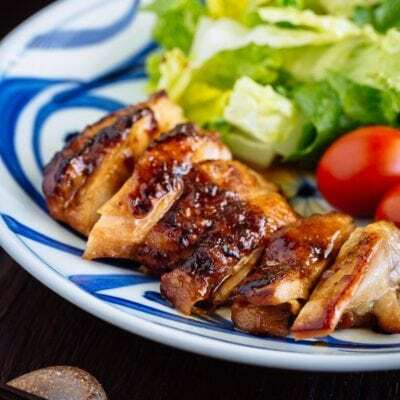 Maybe the “blackness” might have improved if I had put nails, but I’ve seen beautiful black kuromame which had been cooked without nails before. So at the end, it’s really up to you. The taste was excellent! Hope these delicious kuromame will bring you health for the new year. 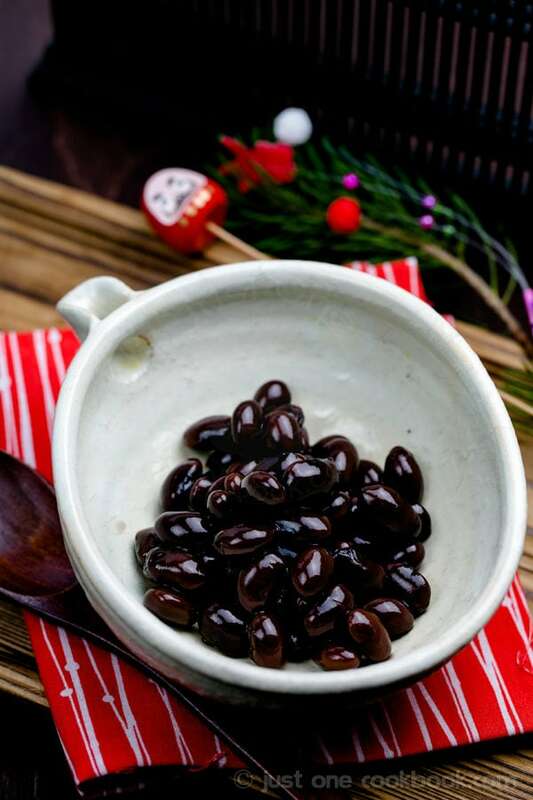 Kuromame (Sweet Black Soybeans) literally means "black bean (黒豆)" in Japanese, and it is often served on New Years Day as a part of Osechi Ryori (traditional New Years Meal). The shinny black beans are beautiful contrasting with red lacquer "jubako" (お重箱) container, which holds all different kinds of colorful traditional meals. Rinse black soybeans and discard bad ones. Some beans have skin that is half peeled off, but you don’t have to throw away. 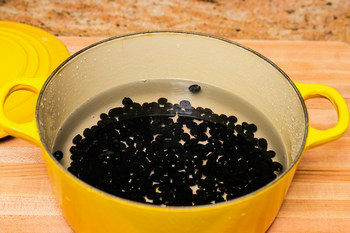 Put black soybeans and the right amount of water in a large pot and let it soak overnight. I soaked for about 12 hours. After being soaked, add sugar and salt and gently mix. 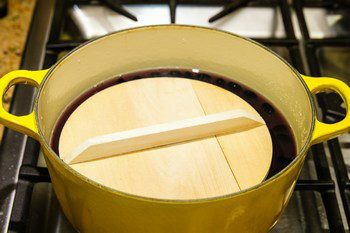 Start cooking over medium heat and put an Otoshibuta and a regular pot lid. The otoshibuta is to keep the soybeans under the liquid (As soon as the beans are exposed to air, they'll start wrinkling.) and the regular lid is to keep the heat in the pot. Once boiling, you start to see white bubbles. Take out the two lids and thoroughly skim the white scum off the surface. When it's done, put back two lids. 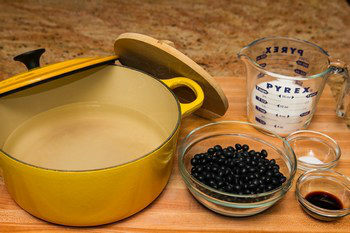 Reduce heat to low and simmer (make sure beans are not “bouncing around”) for 4 hours or until the beans are soft. 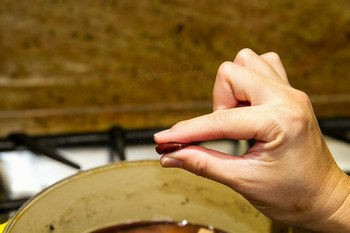 Check if the beans are cooked by mashing a bean with two fingers. Skim the white scum off the surface a few more times while simmering. If it’s easily mashed, add soy sauce. 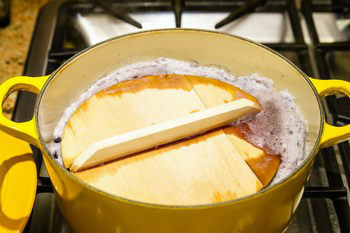 Remove from the heat and place the parchment paper on top. As soon as the beans are exposed to air, they'll start wrinkling. To avoid that, you need to cover the surface of the liquid with parchment paper or plastic wrap. Once the pot is cooled down, keep in the refrigerator overnight. This will help the soybeans turn darker and absorb more flavor. 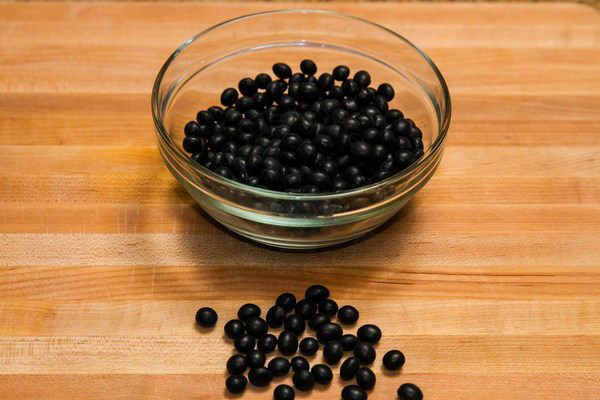 Sugar: The ratio for black soybeans : sugar : water = 1 : 1 : 6. Must be consumed in 3-4 days, otherwise freeze in an airtight container. Traditional recipes require 2-3 “rusty” iron nails. If you use nails, choose very rusty nails, wrap them in cheese cloth and put in the water when you soak over night. Don’t take the nails out until you complete cooking. I can’t believe the bright and shiny look of the beans, makes me try some. Another amazingly beautiful dish, Nami. As another poster said, though, I wouldn’t add the rusty iron nails. 🙂 I can’t believe how perfect your beans are and the setting… bowl, lighting, greenery, serving pieces, they all set off the recipe. 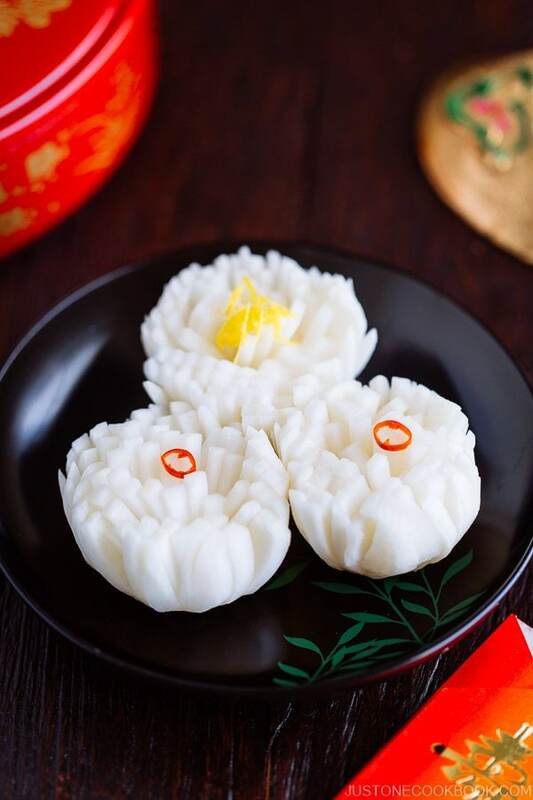 Thanks for sharing this traditional dish! I’ve never had it but I’m so intrigued and definitely want to try it out! Oh and that yellow le creuset is so cute! Now I am curious! Want to try these! These beans look so good! I really like the tidbit about the rusty iron nails. I don’t think I will use them, but would you get similar results by using a cast iron pot? Never really thought just to eat them, but why not? Looks so flavorful! What a great post! I’ve seen these black soy beans before at the Asian grocery but never knew what to do with them. Glad you gave us the recipe. That’s so interesting to use black rusty nails. I believe you. We have a Filipino recipe for a soup dish that suggests the use of a fork inside the stew while cooking. Thanks again for sharing, Nami. Have a great Happy New Year! Catch you in 2013! 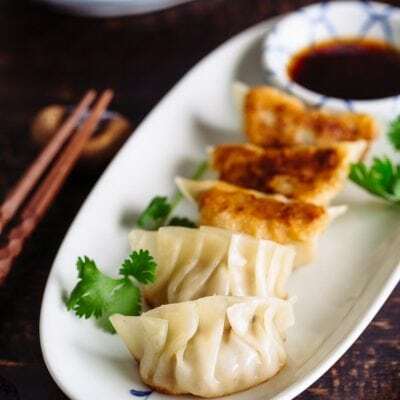 Interesting recipe Nami and love the facts about the rusty nails. Beans are always good in nutrition and as far as I know black beans has more nutrition. Previously the only dish I know how to make use of black beans is brewing as soup and now looking at your post, I can make it to go with porridge! The beans look moreish and the use of and amount of sugar is interesting. Hmm – don’t think I would add the rusty nail: there obviously for the iron, of which we so oft can have too much 🙂 Hope you are having a relaxing and happy wait for the New Year bells to ring!! Much love from across the Pond! 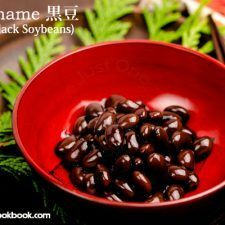 I’ve never tried black soybeans but the color is so intense, I love the contrast with your red bowl! Your recipes are always so new to me! This recipe sounds very interesting! It’s always lovely to learn something new every day. That’s why I love it so much whenever I visit your blog. 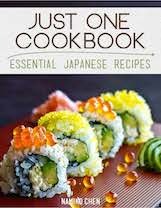 I always learn something new in traditional Japanese cooking, plus, I can drool over your wonderful pictures. 🙂 Didn’t know the traditional way is to put nails to cook these black soybeans. I don’t think I should do that cos I probably will forget to take all of them out. hahaha…. 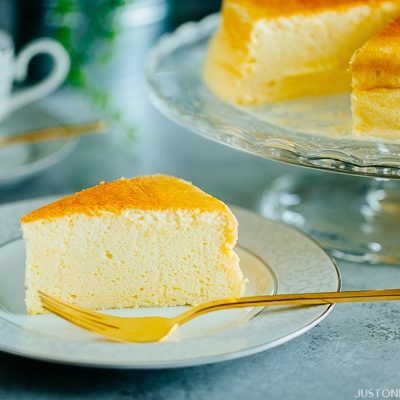 Thanks for sharing such a beautiful recipe. Wish you and your family a prosperous 2013! slow-cooked beans are my all-time favourite, and the simpler the better. This is brilliant, and I will definitely try this.. I’ll keep my eyes open for black soy beans, which I have never come across before. adore the rusty nails! what a fascinating recipe, thanks, Nami. Hi, these soybeans are so shiny and beautiful! They are so inviting and I am really curious to taste them. Wow… these look like little gems…they are so shiny. I eat a variety of foods on New Years day for luck, health etc…. Now I will have to add these onto the list. 🙂 Wishing a wonderful New Year to you and your family!! Nami – Your beans look so cute and yummy. 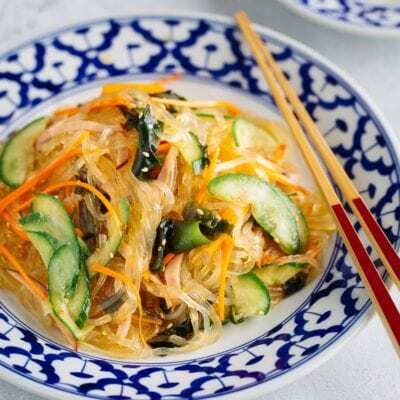 Koreans have a similar dish made with black soybeans – kongjang. Happy New Year to you and your family!! These have such gorgeous color. And your photos really showcase the beans nicely. Great highlights on the beans in all the pictures, the second one in particular (but really, all of them). Love the colors in the first picture. 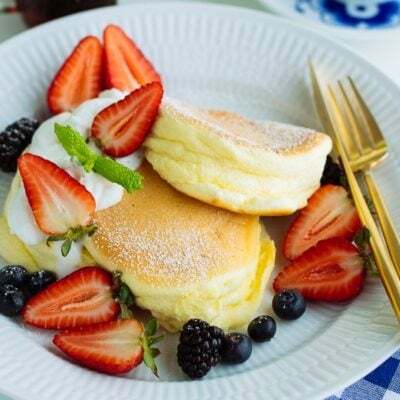 Anyway, I’ve never had these, but they so easy to make, and look so nice, I’ll have to try them. Thanks so much. I think I tried something like this as a banchan at a Korean restaurant. It was delicious! I think I’ll try cooking this in a cast iron Dutch oven. Maybe the iron from the oven will leech into the beans. interesting to know putting rusty iron nails, the beans will turn darker..ya, this black bean has high nutritious factor, we should eat more. Nami, I must say that your blog is one of my most favorite. I learn so much and your posts are always so unique and interesting. I wish you all the best in 2013, more amazing meals, lovely posts and many more readers. You deserve it all. Happy New Year! 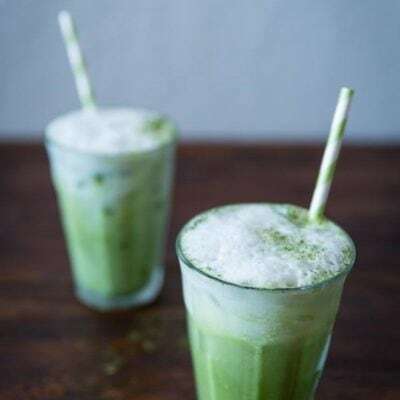 Nami, what an intriguing recipe – it looks so interesting and very healthy! I love it when you post these unusual recipes! 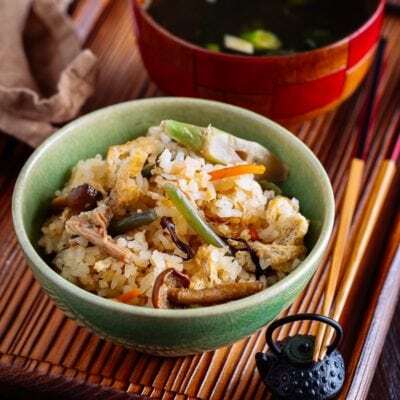 I’m so sorry I have almost missed this another less known, but certainly delicious Japanese dish. I love the rusty nail idea! I wonder if they are dangerous once boiled… You beans look lovely! I hope you are having wonderful holidays. Whoa…that’s so cool. You add nails to get the darker color? That`s some cool chemistry stuff right there! Mark & I are talking about making our own soy bean once we get our own place. I have to check if we can find black soybeans in Minneapolis. They are a lot more flavorful than the white ones. Tough nails I have:) Itadakimasu! P.S. Last night I had for dinner your Shiojake. Superb. 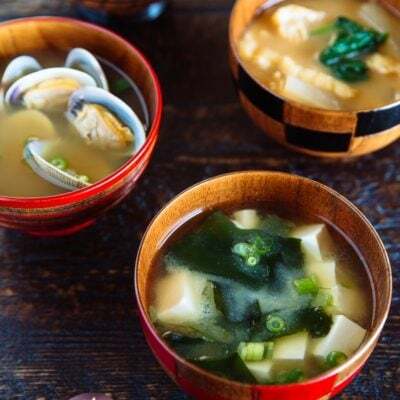 Not to mention the Clam Miso Soup, the Yudofu and Yaki Onigiri, Boiled Squid, Spinach Ohitashi… Your clues are always so clear that is impossible to go wrong. Happy New Year Serena! Wow, you made so many of my recipes!! Thank you for trying them and I’m really happy to hear you enjoyed them and my instruction was clear. You made my day! 🙂 Thank you for your feedback! I really love the glossy appetizing look of the kuromame! Wonderful! wow, that has to be the first recipe I have seen with rusty nails!! Your photos are always so gorgeous. They look so beautiful Nami! Even if I don’t think I will ever find them here, I will keep you recipe in mind just in case I encounter them somewhere. Happy New Year! I’ve been lucky enough to attend several Japanese New Year parties (attending one tomorrow, too) and this is one of my favorite dishes. Last year a good friend shared brought the kuromame and I couldn’t get enough. Looking forward to having a taste again tomorrow night. 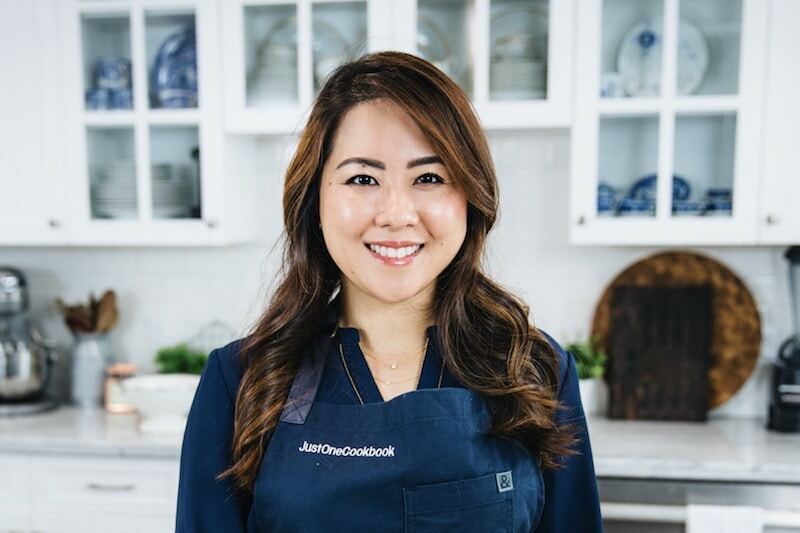 Now I’ll know where to go when I feel like making my own–thanks for sharing your recipe, Nami. Happy New Year! Thank you Miko! It’s been fixed. 🙂 I hope you enjoy this dish. Happy New Year! I’ve been looking for this everywhere! They are my FAVORITE! My grandma always make me eat 黒豆 all the time, and I can’t wait to find these ingredients in Asia! Thank you!!!!! Thank you for sharing. I’m so gonna try this. I love kuromame & stock up on the cans as I can finish it in one sitting. Any ideas on the seaweed or chestnut addition? I’m a pretty brave eater when it comes to trying new things, and I think I actually HAVE some old rusty iron nails out in the garage. If I can find the beans at my local Asian market this week, I may just try this recipe, nails and all! Have you tried making these in a pressure cooker? Wonder if the results e the same? 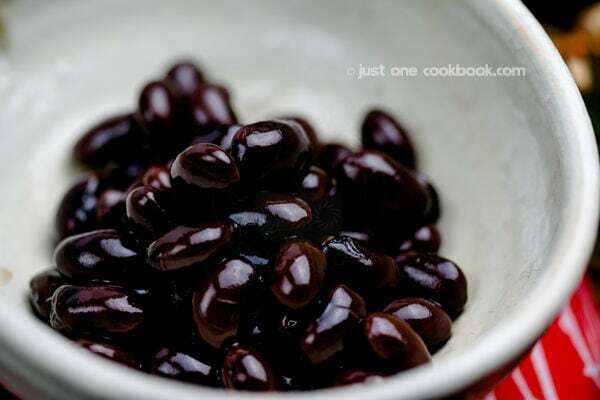 Nami San, can the black beans cook in a rice cooker? 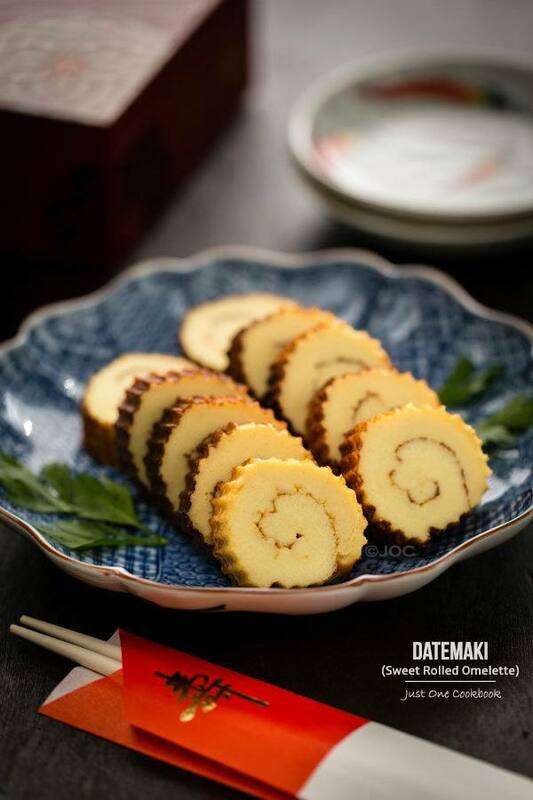 Hi Nami, is this how you would prepare kuromame for kuromame daifuku? Thanks! Thanks Nami! So I should just use your recipe, omit the sugar and salt to taste right? Should I also omit the soy sauce? I was wondering if you could use red soybeans instead. Those were the only ones I could find. Hi Yelissa! It’s actually a good question. I’ve never tried it, and not sure the taste of the particular red soybeans…. I am pretty sure it works, but the cooking time and minor changes may be required…. Thanks for this recipe! I just tried it, following almost every step except for the rusty nails. Next time, I will try it in one of my cast-iron pans and see if it makes a difference. Meanwhile, the beans–a present from my son and future daughter-in-law (a native of Japan)–are now soft and sweet and cooling in the fridge. Later I will give them to my son and his wife-to-be for good luck in the New Year as they set off to spend a year in Japan! Thanks again for such a detailed recipe! Hi Ruth! What a sweet gift you made for your son and future DIL! I’m sure they’ll enjoy your kuromame. Thank you for trying this recipe and letting me be a part of this. 🙂 Good luck to them in Japan as well! Great recipe. Thank you for the recipe! I have been making it for 5 years now. We miss our Japanese family during New Years. Recipes like this reminds us of home. I have been cooking kuromame for years now and what i do is after cooking the beans for 7 hours on low. After cooking let it rest over night then drain the liquid and boil it to reduce the amount in half. 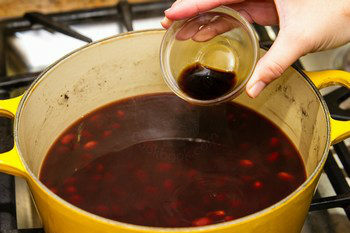 Then return the liquid to the beans , mix and let it sit overnight. Then you are ready to go. My first attempt making these and they were delicious! Thank you so much!